Does your business or school use handheld touchscreens on an everyday basis? 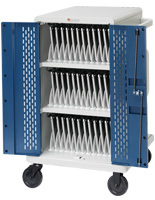 Commercial quality iPad charging carts have become necessary due to the sheer volume of devices in use. School and university classrooms frequently use handheld electronic devices as internal teaching aids. Businessses across every industry, from retail stores to hospitals to manufacturing facilities, issue deparmental or individual employee Apple® and Android devices, laptops and Chromebooks for customer sale interactions, timeclock, recordkeeping, logistics, pick lists, and much much more. In addition, iPad charging carts also help accommodate the BYOD (bring-your-own-device) trend toward employees using their own personal tablets and Chromebooks in corporate and professional office environments. 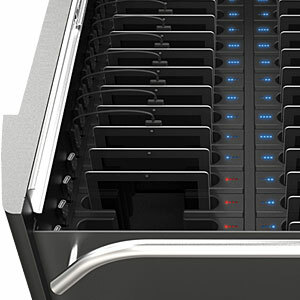 Multi-device storage fixtures with built in power chargers are an invaluable asset for any business or organization. 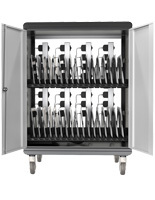 These iPad charging carts, also know as recharging tablet storage, offer varying numbers of charge slots and a variety of mounting, installation, and usage options. Our huge inventory of styles and configurations allow us to match the needs of any business or organization, from simple preschool or educational environments, to multi-level medical, manufacturing, and logistics operations, school labs, and companies with multiple corporate or retail departments. 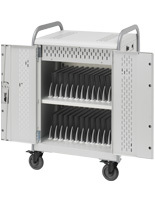 What features are offered by these commercial quality multi-device charging carts? 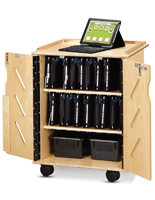 Portability: iPad charging carts offer easy access to devices as well as a variety of usability features designed to match the needs of schools, businesses, facilities, and organizations many different industries. Sturdy caster wheels offer easy movement between locations, while durable steel or wood cabinets are designed for maximum power management and ventilation. Locking access protects installed devices in high traffic areas or public environments. Device compatibility: The simple slotted designs support a huge variety of tablets, laptops, and other devices, including standard and mini iPads, notebooks, android tablets, chromebooks, ultrabooks, Kindle Fire, B&N Nook, HP Touchpad, Dell Streak, and Samsung Galaxy. Power management: Many charging carts include integrated power strips that provide individual outlets for installed devices. In addition to corded power supply and indicator lights for tablets and touchscreens, some of these docking stations offer built-in power efficiencies that charge tablets selectively based on the power needs of each device or a set recharge schedule. In addition to simple battery chargers, many models also include options for syncing devices. 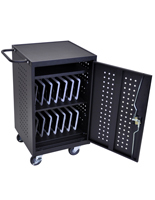 Security, accessibility and safety: Locking tablet storage carts come with either traditional keylocks or programmable combination locks for maximum device protection. The case design is also manufactured with device safety in mind, and includes ample ventilation holes as to keep devices safe from over-heating during storage. Recharging tablet storage capacities vary from 12 to 42 electronic devices. The smaller sizes are ideal for individual classroom touchscreen accessories, as well as storing a study group, department, or sales team's handhelds. These tablet storage solutions offer safe and secure organization for Apple, Android, Samsung devices as well as other electronics. 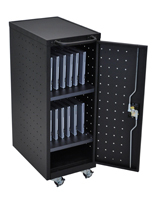 These versatile cases and cabinets not only help protect valuable touchscreens, they help keep them functioning at peak performance for maximum usability in educational, commercial, professional, medical, and manufacturing environments.